Danny Peterson | 7/3/2018, 4:08 p.m.
Cellphone video shows Jason Washington (with arms extended) trying to break up a fight outside a Portland sports bar Friday. He was carrying a permitted weapon which fell from his holster. When he tried to pick it up, Portland State University Police officers shot and killed him. Photo at right is from Washington's Facebook page. 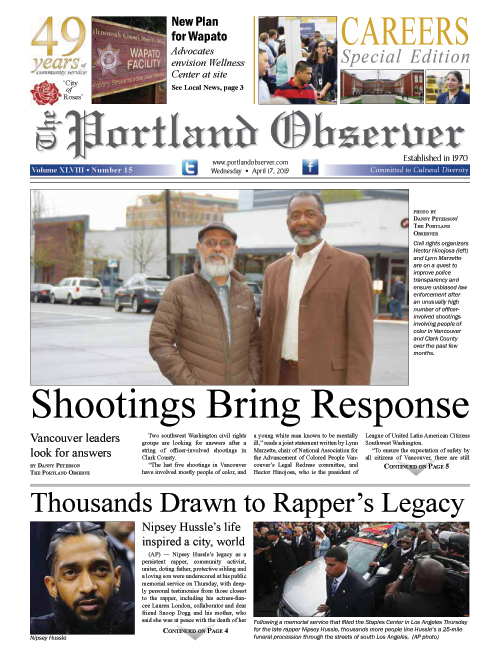 The death of a local black resident and U.S. veteran killed Friday while trying to break-up a fight outside a bar adjacent to Portland State University and marking PSU’s first officer-involved shooting has drawn fierce protests, outcries from the victim’s friends and family and a reignited a debate of whether PSU should have armed officers in the first place. The victim, Jason Washington, was a 45-year-old Navy veteran, father, grandfather, and postal worker. The campus police officers involved have been identified as Shawn McKenzie and James Dewey. Both were placed on paid administrative leave pending an investigation. Multiple witnesses reported that Washington was trying to break up a fight outside the Cheerful Tortoise at 1939 S.W. Sixth Ave. around 1:30 a.m. on Friday, June 29 when he was shot. The PSU officers were responding to the disturbance. Cell phone footage captured by a bystander showed a crowd of men physically pushing each other and falling to the ground during a struggle. The PSU officers could be seen trying to stop them from fighting and commanding others to step back. Washington can be seen trying to stop the fight. The images show a gun holstered on his hip — for which it was reported he had a legal concealed carry permit. He then fell, with the gun underneath him, at which point the person recording the video stepped back and other people blocking the camera’s view of what happened next. But one of the officers can be heard saying “drop the gun,” and then seen pulling out his own firearm and shooting. Multiple witnesses say Washington’s gun fall out of his holster. When he went to pick it up, he was shot, they said. The outpouring of grief was immediately palpable downtown and on the web. “I love you Dad! You didn’t deserve this,” one message, apparently from Washington’s daughter, was scrawled on a pillar near the shooting scene on Monday where many messages of remembrance were written. Social media was lit up with mourning as well. “I need to say that Jason Washington has been a next door neighbor, a fellow dad and one hellava fine family man. That beautiful smile and welcoming persona. It's a tragic loss of a truly good man. Stunning,” Dave Marlin wrote on Twitter Saturday. “Love you so much Uncle #JasonWashington. You didn’t deserve this. RIP,” Washington’s apparent niece, Kyah Lee, tweeted. Washington’s brother, Andre Washington, voiced his “disgust” and mourning at a protest rally on Sunday in which nearly 100 PSU students, friends, family, and activists called for the disarmament of PSU officers. Opposition to the creation of an armed police force at PSU to replace non-armed security officers has been in the consciousness of many college students, faculty, and civil rights activists since it was first proposed in 2014. Tom Hastings, a conflict resolution professor at PSU, was one of the most vocal opponents of having armed officers on campus. Now, he’s starting a petition to get the policy reversed. He’s also calling for the PSU board members who approved of the policy to step down in light of the shooting tragedy.